My mother never said a thing. She seemed sad, but resigned. After all, she had wed through an arranged marriage, like most Yemeni women, so she was in a good position to know that in our country it’s the men who give the orders, and the women who follow them. For her to defend me was a waste of time. Everyone heard the outrageous news story about the 10-year-old girl in Yemen granted a divorce. How could someone so young have even been married? This concept confused and angered Westerners, where there are laws against such disgusting behavior. Fortunately, many women and young girls in the Middle East also found solace and inspiration in the courage of Nujood Ali. My life was taking a new turn in this world of grown-ups, where dreams no longer had a place, faces became masks, and no one seemed to care about me. It hurt me to be talked to that way, with such contempt, and he made fun of me in front of others. I lived in permanent fear of more slaps and blows. Occasionally he even used his fists. Every day, fresh bruises on my back, new wounds on my arms. And that burning in my belly. I felt dirty everywhere. 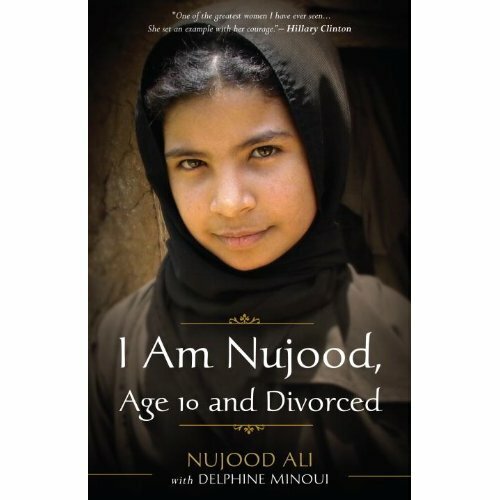 In I Am Nujood, Age 10 and Divorced, Ali provides an unflinching, honest account of her horrific ordeal at the hands of a man three times her age. Her memoir sheds much needed light on archaic practices and the abuse of young girls and women around the world. Her father basically sells Nujood to this man without her knowledge or consent. He repeatedly rapes her and beats her. The thought is just disgusting and unimaginable though it happens throughout the world every day. Girls may not get married at age 10 in the United States and Western countries, but they are certainly sexually abused and enslaved by men. Ali is a typical girl growing up in a country that I associate with terrorism and poverty. She loves drawing with colored pencils, arithmetic and learning Arabic. Ali has dreams of becoming a lawyer just like her hero Shada, the woman who helped her escape the matrimonial bonds and nightmare into which men thrust her. Ali is a brave little girl who, despite her lack of education, managed to outwit her awful husband and beat the system. I Am Nujood, Age 10 and Divorced provides a devastating and hopeful message that little girls in Yemen and other conservative Middle Eastern countries who find themselves in arranged marriages before they even hit puberty sometimes find someone who will listen to them. Sometimes someone will take notice of the injustice. The unfortunate truth is that most of these little girls cannot read I Am Nujood, Age 10 and Divorced . This entry was posted on March 14, 2010, 18:51 and is filed under Books. You can follow any responses to this entry through RSS 2.0. Both comments and pings are currently closed.